Soy supplements have done a real 180 turn over the past two decades. First, we heard that certain types of soy were good for us due to their estrogen mimicking capabilities. We heard that soy may help prevent breast cancer, eliminate PMS and other hormonal issues, and generally be a good thing for women to supplement to their diet. Then we heard the exact opposite. We heard that too much soy in the diet, particularly the processed kind you find in fake vegetarian meats, is bad for you and can actually increase your risk of certain hormonally fueled problems like PMS, breast cancer and more. Well, I happen to agree that too much processed soy is bad. But I think that in its pure form, such as eating whole soy beans or edamame, is good for you. I still stick to that. I think that those that eat soy everything though, may want to re-evaluate their diet. Well, now there is evidence that soy may help to alleviate wrinkles such as crows feet and other facial wrinkles. The supplement is being developed over in Japan by a drug company, and it is primarily based on components that are found in soy naturally. It is being called SE5-OH, for now at least. Since the skin cells have estrogen receptors in them, and the compound that makes up this new supplement is derived from that same compound in soy that acts as an estrogen, it is thought that it may help to smooth wrinkles on women who are going through menopause. 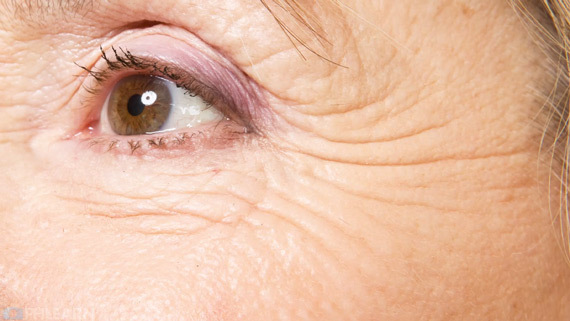 The drop in estrogen in women at a later age is thought to be a major contributor to aging skin in women. The new supplement aims to increase the body’s circulating estrogens by improving the skin’s estrogen levels through these receptors that may take the soy-derived estrogens and therefore making the skin appear more smooth and supple. If this supplement has any degree of success it could very well be a blockbuster for this company. Millions of women in the world (and men) are looking for alternatives to surgery for anti aging and wrinkle skin care, and if this new “skin vitamin” can even help with that a little, it is sure to be a popular one. Shoot, I might be first in line to buy some if it makes it to market! Chances are, it will be a while before we see anything. Most likely if it is successful, and American company may start their own up.